Is your training department ready for VILT? Find out with this eBook. Virtual instructor-led training (VILT) gives students the freedom to learn where it's convenient for them—and makes learning accessible to all customers, employees and partners. However, making the move from traditional, in-person training to virtual training is considered a daunting task by some training departments. How do you know if your organization is ready for this type of change? 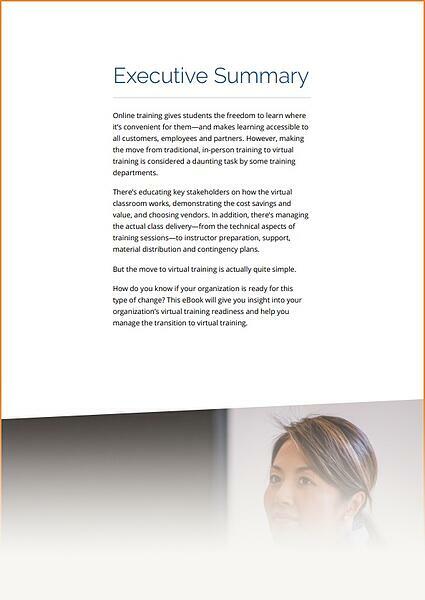 This interactive eBook includes 12 questions that will help you determine your organization's virtual training readiness, give you tips if you're not quite ready, and help you manage the transition to virtual training. And if you haven't already, make sure you use the in person training vs. online training savings calculator to estimate your cost savings if you switched from in-person to VILT. Combined with the in person training vs. online training savings calculator, this eBook will put you on the path to determining if online training is right for your organization.